It’s a pretty easy thing to do if all of your ancestors are from, say, some small island where the population has been stable for generations. But once you start mixing things up, in the process called admixture,2 as populations move and blend, things get dicey really fast. Add to that the fact that different companies and different labs read the same data in different ways (and look at different base populations) and what you end up with is, well, a mess. Let me use my own test results as an example. I’ve tested with 23andMe, AncestryDNA, Family Tree DNA, and National Geographic’s new Geno 2.0 project, and there’s really no way to reconcile the different results … except that I’m pretty much boringly European with maybe just a little tinge of this or that tossed in. • 0.4% “we have no clue” (unassigned). • an 11.72% margin of error on both. Which of these is right? My guess is, none of ’em, entirely, not yet. Every one of these four tests is touted by people who’ll tell you it’s the right one. Yet there are reasons to doubt them all. So… when you ask which test is recommended, and which is best, the answer really is: none of ’em — not yet. The results are getting better, most assuredly, and some of the questions you’re asking may eventually be answered best by the data being collected by the Geno 2.0 project. But none of them, today, is really able to tell you today where your ancestors come from, what countries and continents you might have long lost family from, and what percentage you are or from where. They may promise it, but the delivery just isn’t there. That doesn’t mean you shouldn’t DNA test. Go right ahead! You can still learn about the very deep ancestry of your YDNA and mtDNA (the types of DNA passed down from father to son to son or mother to daughter to daughter and finally to you). And you can still find cousins and share information by testing your autosomal DNA. 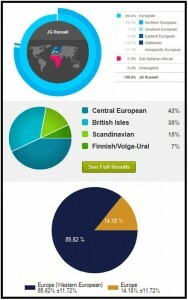 But be realistic about the limitations particularly of the admixture part of autosomal DNA testing, keeping in mind that that part of your results should get better over time. I would be interested to know how the different tests compare with each other on the various markers? Were they all the same? Were there differences?